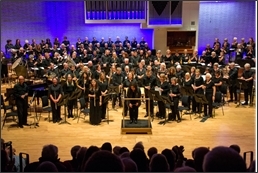 KEMS Concert Band is a community wind band whose members range in age from late teens to 70+. We always welcomes enquiries from prospective players; in the first instance, please e-mail us brief details of your playing experience. At the present time, we have a particular need for drum kit/percussion. Contact Richard Moss 01477 533764) if you would like to know more. Our year started off with a return visit to Brown Edge Village Hall where we were joined by the children of St Anne’s Primary School and a recording team from Radio 3 for our concert which featured the world premiere of a piece written especially for us - Martian Saloon by Chris Schlechte-Bond. This was the final part of the Adopt-a-Composer Scheme which is run by Making Music and it is the second time that KEMS has won a place on this. Thanks to Chris, his mentor David and everyone else who was involved. I hope you heard our interviews on Radio 3! A special mention must also go to John Mansfield for working so hard on ticket sales for this concert. At the beginning of December, we made a second visit to Cheadle Royal shopping centre to help raise money for the charity that Sainsbury’s was supporting – it was a bit chilly! Carols in the Stableyard at Tatton Park went as well as ever and a weekend later some of us went to play at Chatsworth which was another cold do! You would think that our gigs would have got warmer in the New Year but Buxton in March proved to be another ‘character-building’ exercise as the temperature was near-freezing. However, there were some very hardy audience members who really seemed to enjoy our playing! This summer we ‘hosted’ three events for the Barnaby Festival as part of its Roots/Routes theme. The first was a talk by Paul Rabbitts about the history of bandstands with reference to the parks of Macclesfield and the second was a concert in Victoria Park. The third was creating the ‘Fourth Bandstand’ at Tegg’s Nose – this included the world premiere of St Barnabas at the Fourth Bandstand by Julia Harding and a first viewing of the installation Framed by Lorna Green. 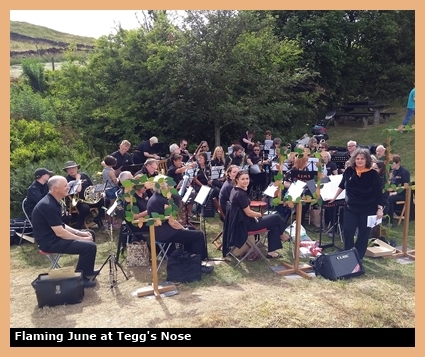 Tegg’s Nose was a real high to end our season on – the weather was fine, the audience was happy and we played some music whilst looking out over a wonderful view – it doesn’t get much better than that! Looking forward to 2018/19, we will be taking part in the events to commemorate the Armistice in Macclesfield, playing in Milton, Stoke-on-Trent just before Christmas and returning to Brown Edge in March. Carols in Tatton Park and some bandstand concerts will also feature. Next August we will be going on our fourth tour (to France). This year, the band membership has been reasonably stable and several of our new members have added to sections where we had missing instruments or enabled existing players to move to new instruments so that there is a reasonable sectional and instrumental balance. This will hopefully enable us to tackle more demanding repertoire next season. On 15th October 2017, KEMS Concert Band gave the world premiere performance of Martian Saloon, by Christopher Schlechte-Bond. Click here to hear the BBC Radio 3 recording. You can contact the band committee either by email (click on the name) or by phone. Normally, we would expect the Secretary to be your first point of contact.